This is the window of room editor. For a description of the buttons and windows please scroll down. For a description of the windows please scroll down. This menu displays different windows. In the top part there are two room timetables. All changes in the room assignment are done by exchanging courses between these two tables. As an alternative to dispaying room timetables you can also display class or teacher timetables containing the room assignment here.The selection boxes allows you to specify what to display i.e. Which room/class/teacher, what detail to display in the table, what kind of table to display (room, class or teacher).Left to the selection boxes there are two buttons. You can exchange room assignments and leave the editor by clicking them. 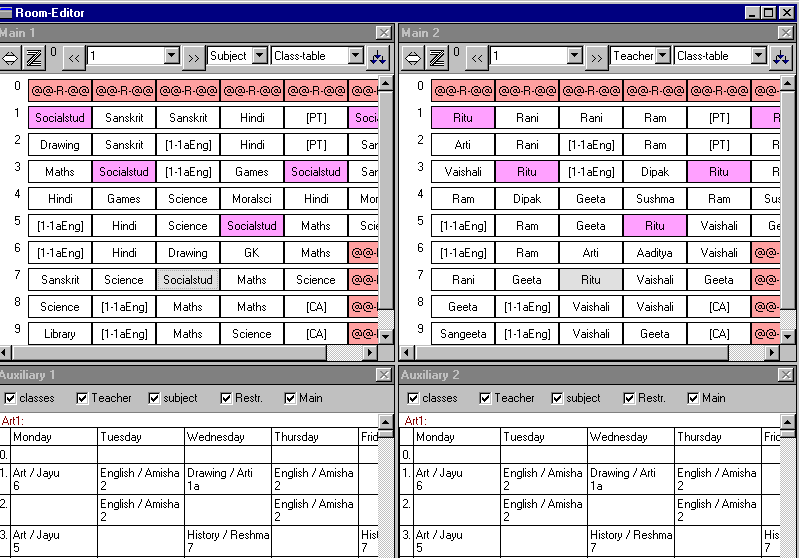 In the bottom part of the editor there are two windows with auxiliary timetables. The switches above the tables specifies what details to display here. This button allows to exit from the room editor and return to main window of TURBO-Planner.